Effective December 1, 2016, ICANN is revising its Transfer Policy. The following is an overview of key points and how these changes may affect your account at DreamHost. The most important thing to understand is that if you make any change to your WHOIS information, your domain will be locked for 60 days, preventing you from transferring. This article explains how to opt out of this 60 day lock and proceed with your transfer. Previously called the “Inter-Registrar Transfer Policy”, this ICANN policy only covered transfers between different registrars. ICANN is replacing this policy with the new “Transfer Policy” which includes the process of changing ownership from registrant to registrant. With the old policy, only inter-registrar transfers triggered the verification and notification process; with the new policy, updates that merely include the registrant’s first name, last name, organization, and email address will now trigger the same verification and notification process. ICANN now requires that that any changes you make to the WHOIS page puts the domain in a 60-day transfer lock; it also triggers notification emails that are sent to the old and new registrant notifying them of the change. How will this affect my account at DreamHost? DreamHost will leverage the designated agent policy option to implement this so that it's as painless for you as possible. As stated in the ICANN Transfer Policy (1.2, “Designated Agent”), it allows an individual or entity that the 'Prior Registrant' or 'New Registrant' explicitly authorizes to approve a Change of Registrant on its behalf. DreamHost will act as your Designated Agent, to approve any changes. You authorize DreamHost to act as your “Designated Agent” to approve each “Change of Registrant” on your behalf (both terms are defined in ICANN’s Transfer Policy). Also, we will automatically implement a 60-day domain transfer lock following a “Change of Registrant” per ICANN’s new Transfer Policy. What happens if I make any WHOIS changes? Any change you make to your domain registration occurs immediately, including edits to WHOIS, nameserver(s), and registrant information. If you edit the WHOIS information in any way on your account, it will result in the notification process and a 60-day lock. This also includes any changes you make to privacy settings. The new emails that are sent for this new process are notification emails, not actionable, so you do not need to take any action. What if I'm transferring a domain away from DreamHost? If you wish to make any changes to the WHOIS information before a transfer, you MUST select the checkbox titled “Opt out of 60-day transfer lock”. 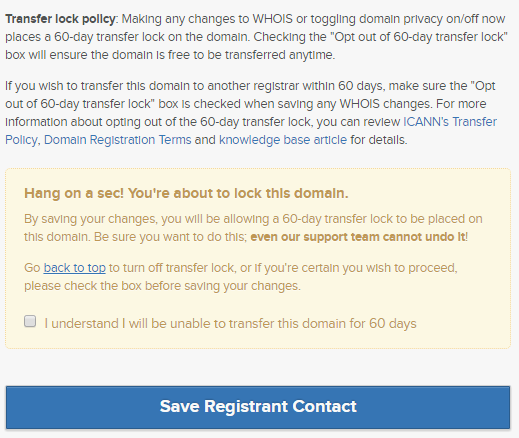 This is mandatory since ICANN will place the domain in a 60-day lock period if you make any WHOIS registrant changes. Please note that even if you change your privacy settings, the 60-day lock is triggered. So make sure the checkbox is selected to opt out. See the instructions below on how to opt out. How can I opt out of the 60-day transfer lock? Click the checkbox for each domain you wish to modify, and then click the blue Modify whois! button. 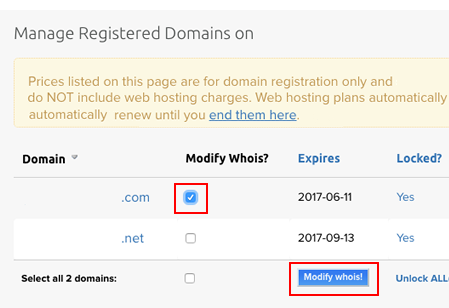 If you have more than one domain, you can also modify all of them by clicking the checkbox at the bottom ('Select all domains'). UNCHECK “I want all of my contact information private”. CHECK “Opt out of 60-day transfer lock”. When finished, click the blue Save Registrant Contact button at the bottom. Article last updated April 10, 2019 20:29 PST.